What do lotus flowers, soap bubbles, and aerated chocolate have in common? They may seem innocuous, even pleasant, but each of these items is a trigger for people who report suffering from trypophobia, or the fear of holes. For trypophobes, the sight of clusters of holes in various formations can cause intensely unpleasant visceral reactions. 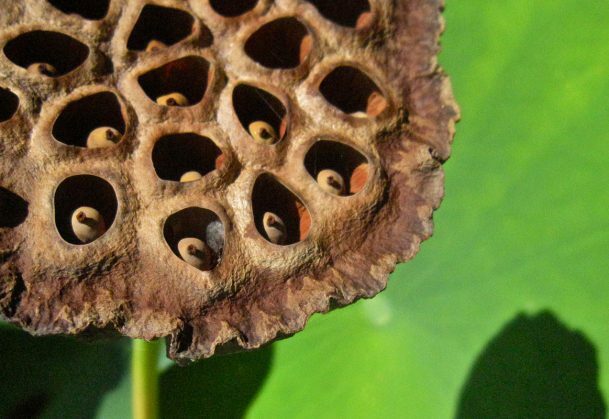 New research from psychological scientists Geoff Cole and Arnold Wilkins of the University of Essex suggests that trypophobia may occur as a result of a specific visual feature also found among various poisonous animals. The findings are published in Psychological Science, a journal of the Association for Psychological Science. “These findings suggest that there may be an ancient evolutionary part of the brain telling people that they are looking at a poisonous animal,” says Cole. Cole and Wilkins, both vision scientists, wondered whether there might be a specific visual feature common to trypophobic objects. They compared 76 images of trypophobic objects (obtained from a trypophobia website) with 76 control images of holes not associated with trypophobia. After standardizing various features of the images, the researchers found that the trypophobic objects had relatively high contrast energy at midrange spatial frequencies in comparison to the control images. Why might this unique visual feature lead to such aversive reactions? One trypophobia sufferer provided Cole with a clue: He had seen an animal that caused him to experience a trypophobic reaction. He and Wilkins analyzed images of various poisonous animals — including the blue-ringed octopus, deathstalker scorpion, king cobra snake, and other poisonous snakes and spiders — and found that they, too, tended to have relatively high contrast at midrange spatial frequencies. In light of this, the researchers speculate that trypophobia may have an evolutionary basis — clusters of holes may be aversive because they happen to share a visual feature with animals that humans have learned to avoid as a matter of survival. In studies currently under way, Cole and Wilkins are exploring whether manipulating the spectral characteristics of images of everyday objects, like watches, leads people to prefer one object over another. They believe these experiments will shed light on just how ingrained trypophobic tendencies might be. I am so happy to read this!!! I have “trypophobia,” although unlike most phobias, it doesn’t impact my life very much. When people have asked me what the cause of it is, I have always said that I thought it was evolutionary or biological. That is, I thought it might have to do with a natural fear of disease (diseased skin for example). But this makes still more sense because along with holes I find scales very disruptive as well as certain bumpy surfaces. One of the strangest I’ve had a reaction to was a large telephone pole on the street with hundreds of large staples in it from flyers over the years. I recoiled from it quite literally and couldn’t look at it. Am so afflicted seemingly since forever and, while not at all so regarding honeycombs, do respond with immediate aversion to IRREGULARLY-shaped clusters. For some unexplained reason, few visual reactions have been more violently revolting to me as were the images of the barnacles attached to the recovered wing part of Malaysia Airlines Flight 370. Just looked up the photo and was again intensely impacted. Not sure that repeated exposure would help me overcome my response. I’ve always been completely repulsed by barnacles! I’m not alone! I also have trypophobia. I’ve had it since I was born I believe. It nice to finally meet others like me after 28 years of thinking I was alone. After long time of research and inquisitive time period I could find the way. Yeah I have been finding my self in for last 2 years never been before that. The reasons are very clear. Uncertain fears which were resulted by family issues. Unresolved matters and uncertainty of reward. When I see these holes , i feel ” who knows what’s inside” it seems something is coming or taking birth from it. But horrible sometime. I am starting trying to gain control over it. If my mind can produce it , my mind can resolve it. It moves inside without the eyesight blind to it … It’s scary the authonomy and intelligence a hole that reassembles a cell, could have .. I am 42 years old and have always experienced a strong adverse reaction to clusters/small holes; so happy to know that it is an actual phobia. I get chills and my entire skull feels tingly – yes, sounds nuts, but true. Unfortunately there seems to be no lack of these types of images online (why oh why do people share these on FB as in “Oh, look how gross this is!”) Good luck everyone, glad to know i’m not alone! I have this phobia. I can’t make pancakes because the bubbles freak me out. Seeing a bee hive makes me cry. The honey comb is too much for me. I don’t know what to do about this phobia. Just looking at images that have holes or dots gives me goosebumps and makes me feel sick. Yikes, I thought I was alone, until Googling this about 10 years ago. Even single holes will get me sometimes, especially if misshapen. A pic of a gaping gunshot hole made me want to throw-up, and not so much from gore of it, just the hole of it. I went to see about going up in a FB group, but they all have pictures that make me nauseated! I have a mild degree of this and am very interested in the subject. If you experience these reactions, would you say you are feeling disgust (it’s gross,) or revulsion (it might hurt me.) It might be a combination of the two. If so, try to express how much of both. I first had the trypophobia attack when I was about 6 or 7, that I can remember. I saw a picture of an octopus and the fear and panic ripped me open! I still cannot look at pictures, or watch on TV that animal. My family always thought I was overreacting, and I assumed it was just a childhood fear. 24 years later, I still have that fear. It has also started to encompass things like diseased skin or holes in a tree or leaf, animal skin or fur that is disfigured. I am uncontrollably sickened and incapacitated when I see these things. I am glad to know I am not alone with this problem. I first realized my issue may be more than just a bad memory of the octopus picture when I was watching the newest American Horror story episode. The character was at a psychologist and mentioned that the piece of coral decoration he had on his shelf was “staring” at her and was disgusting because of the holes. Her comment was quite appropriate to how I feel. I had no idea that my “fear of small holes” was actually a phobia. I thought I was going crazy until I looked it up and saw that it was actually one of the most common phobias. Anytime I see them, I have gagging reflexes, and sometimes panic attacks. I am kind of relieved that I am not the only one who has this. Thank God I’m not alone! WHEN I SEE SOME PACKS OF HOLES.. ALL I WANT TO DO IS TO SQUEEZE IT. THAT’S HOW MY BODY REACTS. I also suffer from trypophobia.I always believed that I was the only person who suffers with this. Just thinking about patterns of holes gives me goosebumps and makes me shiver. I saw an image of a trypophobic hand. It scarred me and I had trouble sleeping for a couple days. I was 10 years old at the time. A couple months later I forgot about it. Then over a year later, I saw another image of it. I couldn’t get the images out of my head. For as long as I can remember, I’ve always had the repulsed, itchy, nauseated feeling when triggered by an image or something in the real world. A few years ago, when it seemed that the first batch of these photoshopped images were ciruclating of that particular plant (that haunts my dreams! ), I discovered that there is a word to describe how I feel, and that trypophobia is a real thing, and that I’m not alone. It takes days to wash away and try to remove the bone scratching willies caused by a trigger image. I feel like I want to turn myself inside out and hold my skin close like a protective hoodie. Someone said their skull tingles – I feel that too! When I’m going about my day, or scrolling through the internet and something pops up out of no where, it catches me so off guard I’ve gagged, or thrown my phone. If ever the image is in front me for more than just a split second, or if I do the stupid thing of trying to “power through” looking at it, the feeling intensifies so quickly. I’m so glad that this has been identified as a phobia – I’ve felt strangely repulsed by holes and bumps for some years now, examples the lotus seedheads, octopus tentacles, virginia creeper (from a distance) pictures of rashes/smallpox, bot fly holes, those adds where people’s hands become skin pores… to name but a few! My triphobia is so bad I’m obsessed with looking at it even though it makes me itch. I also can not look at the shower head or the drain in my tub due to the holes. I have it too but get it in different magnitudes depending on the image. The worst reaction was a picture containing 100’s of perfectly circular holes but all had completely different sizes, this made me sweat, make my hairs raise, feel sick, shudder, feel very uncomfortable…. to be honest most of the symptoms for a panic attack but over a period of 20 mins so much slower. Problem is once these symptoms leave I become fixated on the images until I become distracted and forget about them. Which isn’t too difficult as I also have ADD. Personally I don’t think this is a phobia, I believe it’s more a Pattern triggering Anxiety similar to how flashing lights trigger epilepsy but for anxiety in the brain. But I’m no expert just an experiencer. I knew it was a phobia I just never knew what the name of it was and after looking this up I literally dropped my phone and flipped it over I freaked out my skin feel crawly and I’m still itching as we speak. I’ve never been around animals or had major family issues this recently developed in my adulthood. I would like to get connected to someone researching typophobia. If you can do that please respond. I first became aware of my reaction in 5th grade science class while viewing the cross sections of bones. I remember gagging and have that uncontrolable gagging response for 20 years. I still can’t stand it. My somatic experience says it has something to do with a DNA memory of plagues and disease. I have suffered with trypophobia for months. I made some research how to cure it. I wasn’t able to look at the speakers of my car even the sink at work. The clothes dryer come with pattern holes. I never knew that exposure therapy would help. It was brutal but I was able to manage looking at the images that triggers my phobia. I do this everyday and now I feel better. Where did you go for therapy? Was it online?